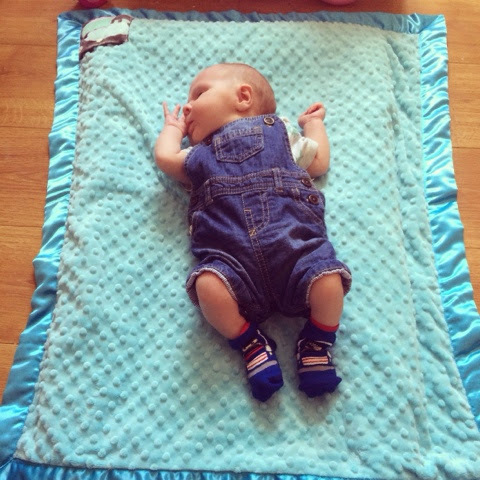 As Jacob is now two month's old and no longer classed as a newborn baby I thought I would look back on what life was like with a newborn baby. If you are a parent yourself you may recognise some of these things. So here is my ten sign's that you are a parent of a newborn baby. 1.) Any time past 5am is now classed as a lie in. Gone are the days of a lie in and lazy mornings. 2.) Coffee is your new best friend, although you rarely get a chance to drink a hot one and normally end up drinking it cold, even though it tastes awful because you need the caffeine hit to stay awake. 3.) You forget what a hot meal taste's like. You can guarantee when you get a takeaway cook a meal as soon as you sit down to eat baby will start to cry. You and your partner will end up taking it in turns to eat while the other tends to the baby. You normally end up eating your meal cold or/and with a fork in one hand and baby in the other. 4.) You end up going out with clothes covered in baby sick. You finally get ready to go out and baby is sick on you, as you are running late you end up going out with baby sick on your clothes. The worst thing is you don't even care as you just want to get out the house. You also realise pretty quickly that baby sick rubs into clothes pretty well. I know I am disgusting. 5.) More then two showers a week is a luxury. I know this sounds terrible but I never got a chance to shower unless the other half is in from work, as I do not want to leave Jacob on his own especially as I also have a one-year-old, she will probably try and feed him wotsits and sit on him. Long gone are the days where I used to spend an hour each night relaxing in a bubble bath. 6.) You spend all your money on cute baby clothes. Baby clothes are so cute and tiny you just have to buy lots of them, your baby ends up better dressed then you as none of your pre-baby clothes fit. 7.) You have not watched a full tv show since having your baby or read a magazine. As a result, you have no idea what is going on in the world of soaps and reality tv and you don't even care anymore. 8.) You have not spent any quality time with your partner and when they come in from work you end up passing baby to them. When you do get a rare five minutes alone with them you normally end up talking about the baby or who's turn it is to do the washing up. Or in my case arguing who has had the hardest day, him at work with his coffee and lunch breaks or me at home with the children all day changing nappies and dealing with a screaming baby. I so have a harder day than him -fact. 9.) If you look at your phone's camera you will have at least one photo every day of your baby sleeping since they were born. 10.) All your tweets/status updates/ Instagram photos/ blog posts are updates or photos of your baby and nothing else - I am very guilty of this one lately. Those are the ten thing's that happen to me when I have a newborn. I would love to know what signs you remember from life with a newborn baby. Good most and I recognise most of these, particular when trying to eat at meal time! We've been pretty lucky with sleep and often lay in bed till 9 ish with the little one!